The Bachelor 2016 airs on ABC this evening with an all new Monday March 7, season 20 episode 10 and we have your weekly recap below. On tonight’s episode, Ben Higgins faces 17 of the bachelorettes he sent home as they discuss the season. On the last episode, romantic adventures awaited Ben and the final three bachelorettes – Caila, Jo Jo and Lauren B. – as they traveled to beautiful Jamaica. From a rafting trip down a jungle river to a romantic dinner on a beach, from rescuing a nest of endangered baby sea turtles to a dip at a magical waterfall deep in the jungle, the dates were filled with passion and excitement. If you missed it, we have a full and detailed recap right here for you. On tonight’s show as per the ABC synopsis, “tempers flare, and there are plenty of fireworks, as the most memorable women this season are back to confront Ben and tell their side of the story. There were highs and lows during Ben’s’ unforgettable season – and then there was Olivia, one of the most controversial bachelorettes of the group. We will be live blogging tonight’s episode of the The Bachelor 2016 and you just know there is going to be tons of drama, cat fights and tears. So come back tonight at 8PM for our live recap of tonight’s episode. While you wait for the recap, hit the comments and let us know how excited you are for this season of The Bachelor? Tonight’s episode of The Bachelor is the always entertaining “Women Tell All” – where Ben’s exes take the stage with Chris Harrison and discuss all of the drama that went down in Season 20. Chris Harrison takes the stage, but before we can get to the juicy drama, Chris shares some footage of him and Ben crashing Bachelor Parties around America to meet some diehard Bachelor Nation fans. There’s nothing like seeing 40 grown women in their pajamas scream and fawn over Ben in their livingroom like he’s a rockstar. Now, it’s time to introduce the Bachelor women – there are some fan favorites like Caila Quinn and Becca Tilley. And, some not so favorite women on the stage tonight – like Jubilee, Lace, and Olivia. Before we get started, the most recently dumped woman, Caila, praises Ben Higgins. Despite the fact that he just broke her heart, Caila insists that Ben is ‘the greatest guy’ and he made them all fell comfortable. Chris Higgins shares a highlight reel of the women all bickering and talking behind each other’s back all season. After the clip is over, Emily jumps at the chance to talk about her beef with Olivia. She is interrupted by one of the girls’ pet chickens that flies across the stage. Chris Harrison turns the talk to Leah – who shocked everyone by coming out of left field and telling ben that Lauren was a fraud and acting fake. Leah stands by what she said, she insists to Chris that Lauren was fake and she told the other girls they were “losers” for falling for Ben so fast, and getting upset over him. Talk turns to Jubilee, who also caused some drama between the girls. Jubilee tries to say that she was just misunderstood. Jami and Amber pipe up, and apparently there was some serious racial problems behind the scenes. At one point Jubilee supposedly said that she was the only “real black girl” on the show, and she was going to make it farther than any of the other “full black girls” on the show. Jubilee is floored by the accusations that the other girls made about her racist comments. She begins crying, and insists that she never referred to herself as “the real black girl.” She admits that she called herself “full black” – but she would never be racist. Jubilee finally caves and apologizes to Jami and Amber after bickering back and forth for a few minutes. Chris shares some footage of Jubilee and Ben’s dates while she was on The Bachelor. Afterwards, Chris explains to Jubilee that while they were filming – Ben talked about her all the time, and he fought so hard to try to make things work for her. He asks Jubilee where she thought that it all went wrong. Jubilee explains that her background, and the fact that she was an orphan, really makes it hard for her to trust people and she always makes things complicated. She breaks down in tears, and says that she got very insecure on the show – and she honestly didn’t think that she had a chance to win Ben over the other girls. Chris gives Jubilee a pep talk about her future relationships. Before Jubilee’s time in the hot seat is over she reveals that she is still working hard in the army, and she just made seargent – of course Chris thanks her for her service to our country. Lace is the next girl in the hot seat – she was only one the show for a few episodes, but she definitely made it entertaining. Lacey explains to Chris that she just “wasn’t in a good place” and she was really overwhelmed by the whole atmosphere of the show. She insists that she has been going to therapy and working on being a better Lace. While they are chatting a member of the audience interrupts and runs up on stage – apparently he is a huge fan of Lace and got her face tattooed on his stomach. Lace doesn’t seem to creeped out, she takes a selfie with the creep, and then Chris boots him off stage. Before Lace’s time in the hot seat is over, Chris invites her to be on Bachelor In Paradise and she accepts his invitation. Now, it’s time for the woman we all love to hate to take the hot seat – Olivia Caridi. Olivia explains that early on in the show, she thought that Ben Higgins was the “man of her dreams.” Olivia says that she is kind of like Jubilee and the other girls didn’t “get her” – but Ben got her. She gets emotional looking back on her time with Ben, and the good times they had before everything went wrong. Olivia says she regrets calling Amanda a “teen mom” and she apologized – but she wants everyone to know that Amanda said things too and she never apologized. Amanda interrupts and says that the Teen mom comment was just the tip of the iceberg. She was offended because Olivia also said that guys should “run the other way from women with kids.” Emily gets fired in and pipes up that Olivia bullied all of the other girls and implied that Haley wasn’t “wife material” because she was wearing a low cut dress. In an interesting twist, Leah actually tries to defend Olivia and says that the other girls were bullying Olivia right back. Olivia cries that she was severely bullied when she was younger – and she felt like she was back in highschool. Every time she walked in to a room, the girls would all stop talking and stare at her. The women aren’t buying her excuses though. Isabell points out that if Olivia was really a victim of bullying – then she would have changed her ways and learned from her mistakes. Olivia explains to Chris that her sister has had to take over her social media accounts because everyone has been harassing her and making fun of her body. Olivia makes a public apology to any of the mothers that were watching the show. Now it is time for the most recent woman to be dumped by Ben Higgins to take her seat on stage – Chris Harrison shares footage of Ben and Caila’s time together on The Bachelor. Caila explains that she was blindsided in Jamaica when Ben dumped her – she went to his hotel to surprises him and tell him that she missed him, and she wound up getting dumped instead. Caila gets emotional when Chris replays her and Ben’s break-up scene. She explains that it is really hard to watch back, and she couldn’t believe that Ben said he loved Jojo and Lauren – but turned around told Caila that he never really loved her. Caila admits that in a way watching the show helped her – because seeing the way Ben looked at Jojo and Lauren, only made her want to find someone that loves her that much. 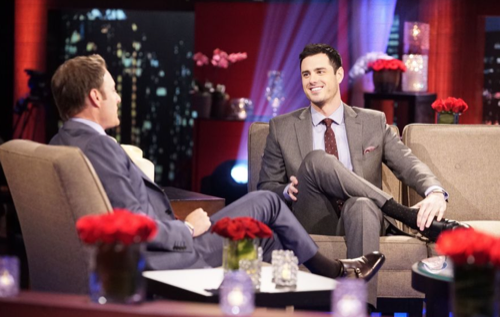 It’s time for the moment we have all ben waiting for – Ben Higgins takes the stage with Chris Harrison to finally face all of the women that he dumped. First and foremost, Chris obviously wants to talk about Ben telling TWO women that he was in love with them. He commends Ben for “going with his heart” and compartmentalizing all of his dates, and making each woman feel like she was the only woman in his life. Ben Higgins addresses Caila and what she said about their break-up, he thanks her for all of their heart to heart talks and helping him live life to the fullest. CAila thanks him for his kind words, and thanks Ben for always being genuine. Ben insists that his relationship with Caila was real, it’s just that his relationships with Jojo and Lauren were progressing further. Jubilee takes the time to address Ben about something that has been really bothering her. Ben told her that he wanted her to open up – but when she watched the show, there were other girls being even more closed off than her, but Ben kept working with them. She wants to know why Ben didn’t try that hard with her, like he did with some of the other girls. Ben explains that he thought he had given Jubilee more than one chance, and he apologizes for making her feel like he had given up on her. Believe it or not, Amanda has nothing bad to say about Ben – even though he dumped her right after he met her kids. Amanda says that when she watched the show back and saw how emotional Ben was when he dumped her – it made her feel better, to see that he really cared about her.